My family eats a lot of raw foods and we also enjoy food that comes from “nature”. The GoodOnYa bar is a tasty option for eating on the go….I can’t tell you how many times I would get hungry and forget to have a snack in my bag. It is often difficult to find a truly healthy, natural and satisfying snack but the GoodOnYa bar is a wonderful option. It is perfect for “on the go” and you can feel confident in the ingredients in this tasty bar. 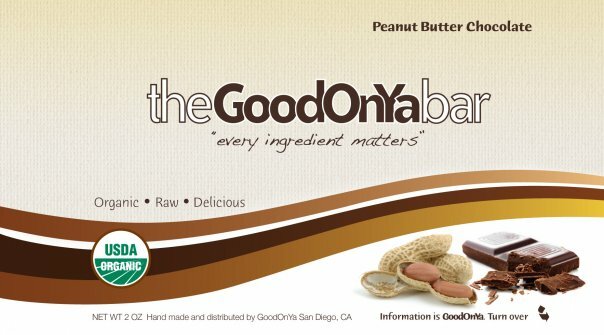 The GoodOnYa bars are 48-76% raw, depending on the flavor, use NO fillers (I love this! ), non GMO, no dairy, has good fiber and is Gluten free. I really appreciate that it is soy free because I prefer not to use any type of soy in my food choices for myself and my children. How do the bars taste? Absolutely delicious…..it felt like an indulgence and was very satiating when I was looking for a quick snack or breakfast. The Peanut Butter Honey is my favorite and my kids really like the Peanut Butter Dark Chocolate. With ingredients like organic peanut butter, organic honey, cold milled flax seed, raw sesame seeds, Celtic sea salt, raw hemp seeds and vanilla …..this is one food that I feel good about offering to my children as a special treat when they ask for desert or tell me that they are hungry after playing the afternoon. When I stock up on the GoodOnYa bars I plan to always keep some in my bag for those times that I need to re-nourish with a healthy option. You can learn more about GoodOnYa bars at their website and view all the purchasing options and flavors. I learned their Breakfast Bar has 28% of the daily recommended allowance of fiber in just one bar. I learned the bar was invented by a former US Olympic athlete! The primary store is located all the way across the country from me 🙁 I had one of these bars once, and it was amazing, I’d love to try all the flavors. They have their own blog! that the bar was invented by a former olympic athlet ty. that the bar was invented by a former olympic athlete ty. I learned that they do not use fillers. These bars are high in fiber and protein! They even use hormone free milk! I learned that Pure Maple Syrup, Honey, Agave Nectar, Pure Cane Sugar are good alternatives to Refined sugar and High fructose corn syrup. Likes The GoodOnYa Bar on Facebook. i learned that they have the peanut butter honey which sounds amazing! I learned their Breakfast Bar has 28& of the daily recommended allowance of fiber in just one bar. i learned that there are no fillers in their bars.